England have called Durham leg-spinner Scott Borthwick and Kent off-spinner James Tredwell into their Ashes squad following Graeme Swann's retirement. Borthwick, 23, could win his first Test cap on Boxing Day, though slow left-armer Monty Panesar is favourite to replace Swann for that game. Tredwell, 31, has one Test appearance and will not arrive in time to play. Two spinners are unlikely to play in Melbourne, but could feature in the fifth and final encounter in Sydney. England have already surrendered the Ashes after losing the first three Tests. Swann announced his shock retirement on Sunday after taking only seven wickets so far in the series. The 34-year-old former Nottinghamshire player is sixth on the list of England wicket-takers with 255 in 60 Tests. 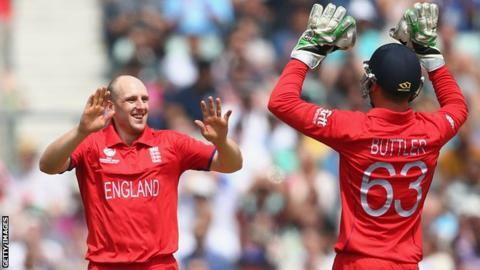 Tredwell took 6-181 in his solitary Test match appearance, in Bangladesh three years ago, but has also played in 24 one-day internationals and seven Twenty20 internationals. He was travelling to Australia for the ODI series, starting on 12 January, and has moved his flight forward to join the Test squad. "I'm cover for that final Test in Sydney where it has been known to turn," said Tredwell. "The way I'm looking at it is potentially they may play two spinners." Tredwell said Swann's retirement had caught him by surprise but saw it as an opportunity to press his own claims. "It does open your eyes a little bit that obviously there may be some opportunities for some people along the way," he said. "Whether it's me or not, we'll wait and see. In a way, it's an exciting time." Borthwick, meanwhile, has played for England just three times, twice in one-day internationals and once in Twenty20 cricket. All three appearances were in 2011. He is currently playing grade cricket in Australia and scored 1,000 runs last season to help Durham win the County Championship. In 59 first-class matches for Durham, Borthwick has taken 110 wickets at an average of 31.29, while Kent bowler Tredwell has 352 wickets from 140 outings at an average of 35.75. Essex spinner Panesar remains the most likely replacement for Swann for the final two matches of the series. The 31-year-old has played in 49 Tests for England, taking 166 wickets at 34.56 runs each, following his debut in India in 2006. He is confident he can raise his game, despite his own mediocre performance as second spinner in the second Test defeat in Adelaide. "I definitely feel ready coming into this Test," he said. "I'm really excited. The Boxing Day Test in Australia is a huge occasion and excites all of us." Panesar left the England squad temporarily at the weekend to bowl in a grade match in Sydney. He added: "Opportunities that come my way, I've got to grab them. I know my strengths as a bowler and try and make the most of the opportunity and be ready for it. "There are improvements I need to make in my game. As part of that, I've made a decision to play grade cricket after the Ashes because I want to improve." Former England captain Geoffrey Boycott has backed Panesar to become England's main spin bowler, but Swann talked up Borthwick's credentials as he bowed out of the game. "I think Monty's going to come in and do a great job in this game coming up this week and whoever ends up taking the role full time will do a great job as well," said Swann. "Personally, I hope little Scotty Borthwick gets the chance before long. He's a leg-spinner, he's got a bit of X-factor and he can bat as well."